Like many movie lovers I'm a long-time devotee of the films of Joel and Ethan Coen. One of my favourites is their 1991 comedy Barton Fink, about a narcissistic New York playwright's soul-destroying experiences in 1940s Hollywood. John Turturro's memorably pitiable portrayal of the title character, and the film's loving attention to period detail, exquisite comedic exaggerations, and touches of magical realism, make it one of the all-time great films about making films. 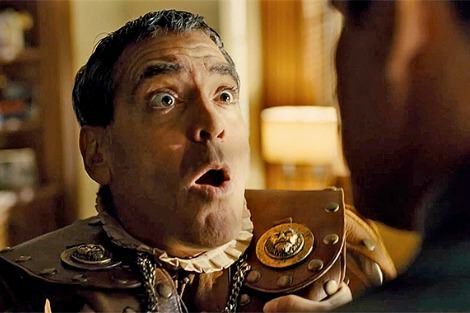 The Coens reiterate their feelings about mid-century Hollywood — apparently, equal measures of love and disdain crammed into the same cinematic bucket — in their latest film, Hail, Caesar! ; a fictional story about a day in the life of real-life Hollywood 'fixer' Eddie Mannix (Brolin). The film fast-forwards a decade from Fink to weave commentary on Cold War era politics and the Hollywood blacklist around its various pastiches of films of that time, from westerns to musicals. We meet Mannix on a day when he has plenty to 'fix'. The star of the studio's latest, Ben-Hur style biblical epic (also called Hail, Caesar! ), Baird Whitlock (Clooney), has been kidnapped by a rabble of blacklisted screenwriters. A pair of rival, twin entertainment journalists (Swinton) are bugging him for a sensational headline. Meanwhile Mannix is trying to kick the career of slow-witted western film star Hobie Doyle (Ehrenreich) to a new level by having him cast in a period drama. This is a skilfully made film (the work of veteran cinematographer and longtime Coens collaborator Roger Deakins is characteristically excellent) that is alternately as baffling and as hilarious as anything the Coens have made. A scene in which Mannix surveys a roomful of religious leaders about the theological acceptability of Hail, Caesar! (of the nature of the Trinity they reply: 'There is unity in division!' 'And division in unity!') is Coen Brothers gold — sharp and sardonic. It doesn't take long either to realise that the treatment of religion is about something more than laughs. Mannix works for a studio called Capitol Pictures, and thus is aligned by the Coens with the most facile aspects of capitalism, in their probing of Cold War dynamics. Yet there is a running joke in which Mannix, seemingly unconcerned by the ethical dimensions of his work, goes to confession merely to tell his priest that he has been sneaking cigarettes when he is supposed to have quit. Later, a monologue delivered by the Roman officer/Christian convert played by Whitlock in the film-within-a-film is comically interrupted when the actor stumbles on the word 'faith'. The impression is of characters and an industry whose attempts to engage with meaning and profundity are invariably undercut by ego, greed or idiocy. (The film does something similar with its extrapolations of communist theories.) It's a point that might ring as true of commercial Hollywood today as in the 1950s. This answer is disingenuous at best, since filmmakers choose what stories to tell, and how. (And let's not forget that the Coens typically write, direct and produce their own films.) In fact the question about diversity might have gone further, to include gender. Aside from Swinton's dual role and a tour-de-force cameo from Frances McDormand, the only substantial female character in Hail, Caesar! is Johansson's aquatic performer, whose unwanted pregnancy is another 'problem' for Mannix to solve. Filmmakers choose what stories to tell, and with a few notable exceptions, the Coens tell stories about white men. Like fellow 1990s cinematic great Quentin Tarantino, the Coens' career consists of a body of work that deserves all the admiration it gets. But greatness doesn't negate responsibility, and the extent to which their films are ethically grey should be justified by a continued engagement with ethical questions. Just as Tarantino ought not be let off continuing to discuss the role violence and misogyny play in his films, the Coens should engage meaningfully with questions of diversity in theirs. And so should their fans. I dispute your assertion that the promotion of diversity--racial, gender, or otherwise--is the universal responsibility of any artist. There are those who will chose to make it their business and those will not. The expectation that it is the rightful burden of any work of art neither good for art or for social progress. God bless those artists that tell the stories they want to tell, paint the pictures they want to paint and sing the songs they want to sing. Joel's answer was not disingenuous at all and I concur it is not the responsibility of the artist to chose artistic expression that allows the representation of a minority acting group. The suggestion of superimposing this criteria over art is so off mark it beggars disbelief. But in the film are not the Coen's recognizing the unfortunate reality of the 1950s? My understanding is that in those years life revolved around males, with females reduced to subservience and obedience. Inspecting advertisments of those times supports this, as does that old saying "barefoot and pregnant in the kitchen". Not being a film buff I would not think of commenting on the quality or otherwise of the "art" of the Coen's films. Certainly and artist should have wide-ranging freedom to practice their art. But anyone running a multi-million dollar business has social responsibilities on many levels. Does this apply to movie making? My assertion is not that 'the promotion of diversity ... is the universal responsibility of any artist', but that, given the well-documented lack of diversity in Hollywood (and as Vin Victory points out, in this we are not merely talking about 'art' but a commercial industry dealing in many millions of dollars), celebrated mainstream filmmakers like the Coens (who have more creative control than most) can't just brush aside questions about the lack of diversity in their films as 'idiotic', as they did in that interview. There is an argument that can be made (as Mike does above) that a film set in 1950s Hollywood will necessarily reflect the lack of diversity of that era. At the same time the question can equally be asked, even if women and people of colour were marginalised in that era, whether a film made in 2015/2016 should reinforce rather than challenging or subverting that marginalisation. Of course a filmmaker or artist may choose not to 'promote diversity' in their art. But if they make that choice and the result is that they reinforce the lack of diversity that is already rampant in the creative industry in which they work, then I would argue that they DO have a responsibility to engage seriously with questions about WHY they made that choice, and to consider the ways in which that choice may or may not have been influenced by cultural bias or the lens of privilege. Otherwise they ARE part of the problem. Rather than saying the Coen brothers (or any other film maker) should have more diversity in their films, surely we need to be promoting film makers from different backgrounds so they can tell their stories with authenticity and passion. The viewing public needs to support diverse film makers to get diverse films.